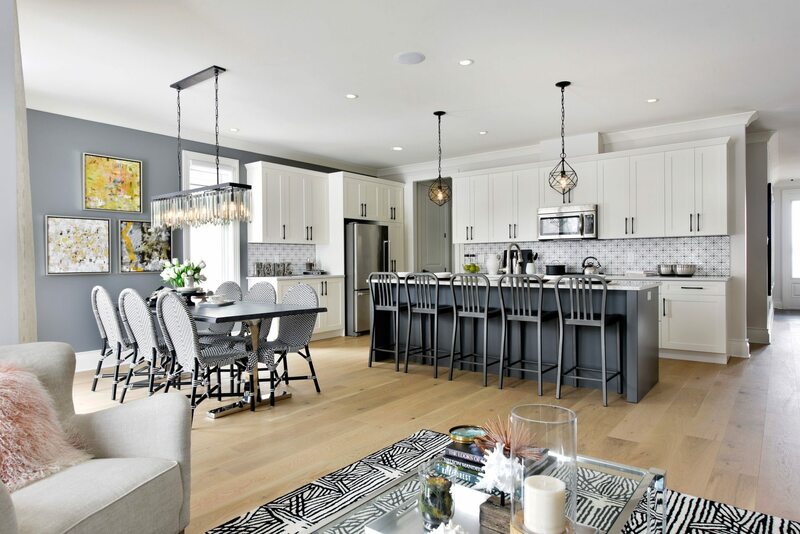 The historic village of Manotick is home to a community leading the way with fresh new designs. 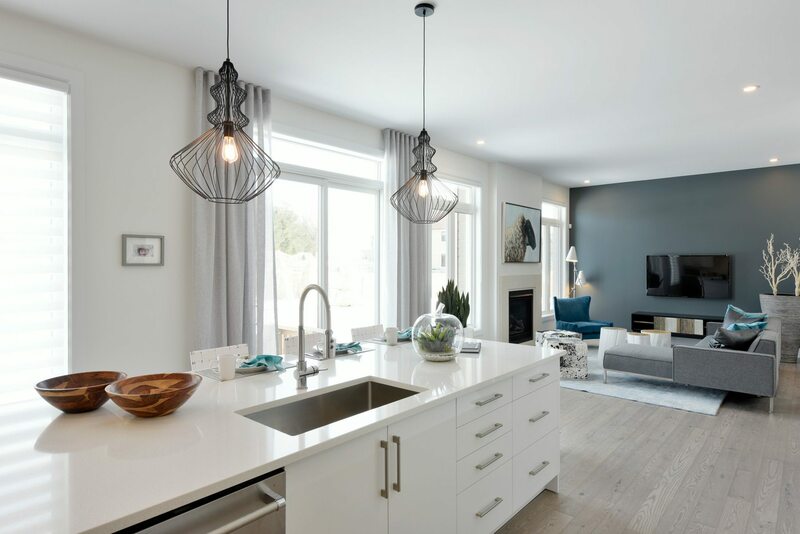 Mahogany by Minto is a masterfully designed neighbourhood offering larger lots than would typically be found in the suburbs, with a charm that compliments the village of Manotick and a modern aesthetic today’s homebuyers have come to expect. 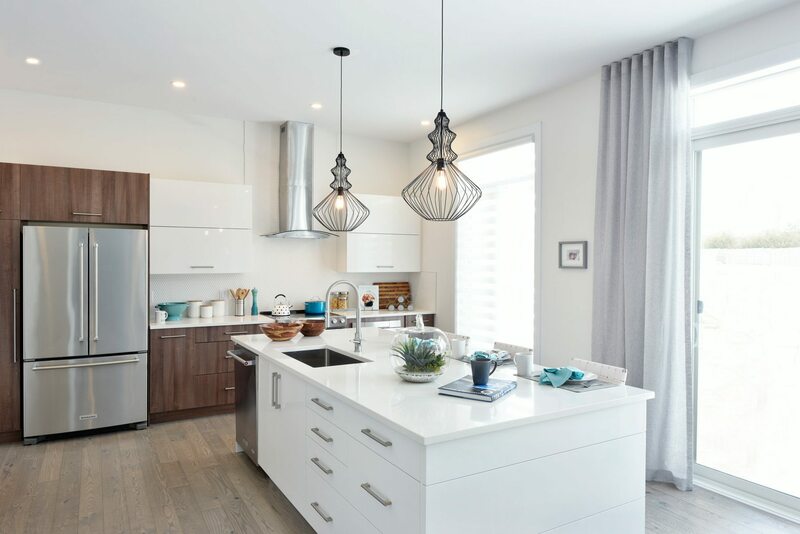 At the beginning of March, Minto unveiled three new designer-decorated show homes available in Mahogany, and the response has been extremely positive from homebuyers. While each of the designs are unique, they have in common specific elements that define the Mahogany aesthetic: large windows that maximize light and offer vistas of the area’s natural beauty; modern touches such as airy, open concept spaces, clean lines, and high ceilings; standard features including hardwood flooring and granite countertops; and homes designed around creeks, ponds, and indigenous species of trees. This bungalow design is the perfect home for empty-nesters looking to move from their two-storey home to a bungalow. With a palette of charcoal, olive, and pale pink blush, the traditional décor of the home has a classic look that’s complemented with contemporary touches. 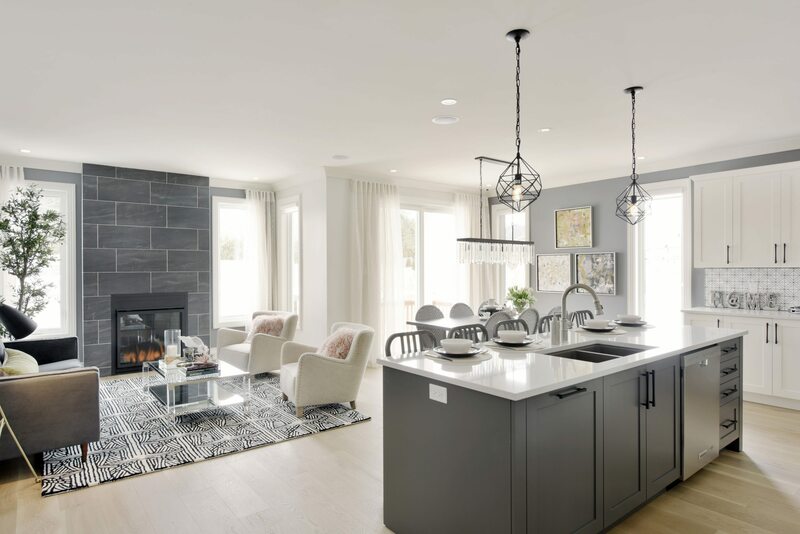 The heart of this home is the open concept kitchen, dining room, and great room space, which is illuminated by large windows and defined by a fireplace. The classic-looking kitchen includes an extended island and breakfast bar — perfect for both cooking and entertaining. The main floor also includes a laundry room for ease, and a covered deck off the dining room for relaxing and barbequing. The master bedroom on the main floor includes an oversized walk-in closet and a four-piece ensuite bathroom. 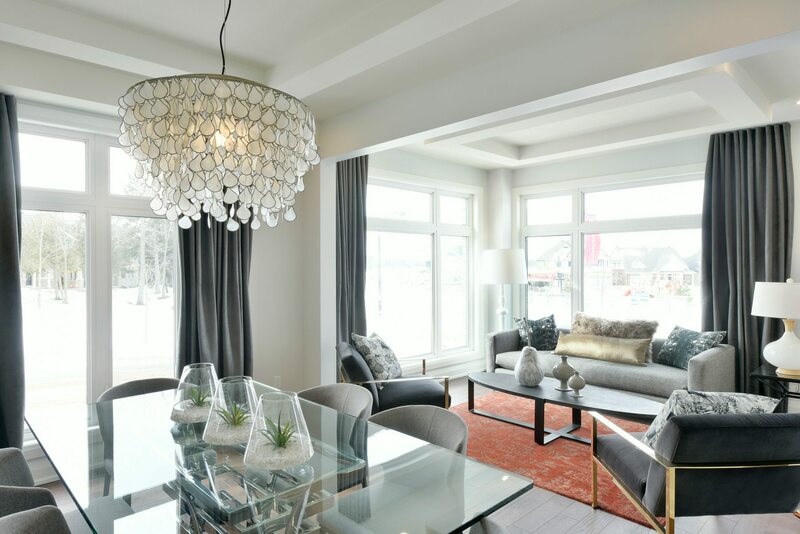 The Butternut features two bedrooms and a den, all on one floor, as well as a spacious, finished basement with an additional bedroom and bathroom for guests. Growing families are the inspiration behind the Heartwood design. The Heartwood features four bedrooms, two-and-a-half bathrooms and a main-floor den, offering plenty of space for everyone. This home has been designed with modern aesthetics in mind: clean lines, geometric shapes, neutral colours, and soaring 10-foot-high ceilings. It includes finishes in metal but is warmed with small touches of vibrant colour throughout. 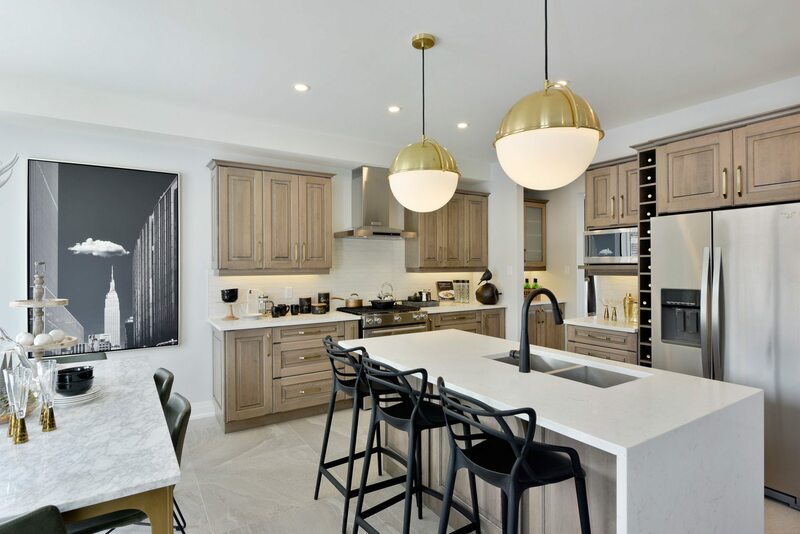 While day-to-day life unfolds in the bright and airy open-concept kitchen – that includes an oversized island, breakfast area, and great room – families will also appreciate the Heartwood’s separate, formal dining room for entertaining. The spacious mudroom on the main floor will be an asset to any family: it contains space for outer-wear and ample storage for sports equipment. On the second floor, the master bedroom includes abundant closet space and a luxurious four-piece ensuite. The remaining three bedrooms are decorated in fun and contemporary colours, and a laundry room on the same floor makes this chore easier. A family with a full house will appreciate the Elderberry, a home that accommodates the needs of busy working parents, active kids, and the daily comings and goings of family and friends. The formal living room and dining room spaces are surrounded by oversized modern windows, and accented with decorative ceilings — and for ease in accessing food, drinks, and dishware, an adjacent butler’s pantry connects this space with the kitchen. The kitchen is finished with distressed cabinetry, creating a sense of history while remaining modern. Autumnal tones of chocolate, muted golds, and black define the overall palette of the home. 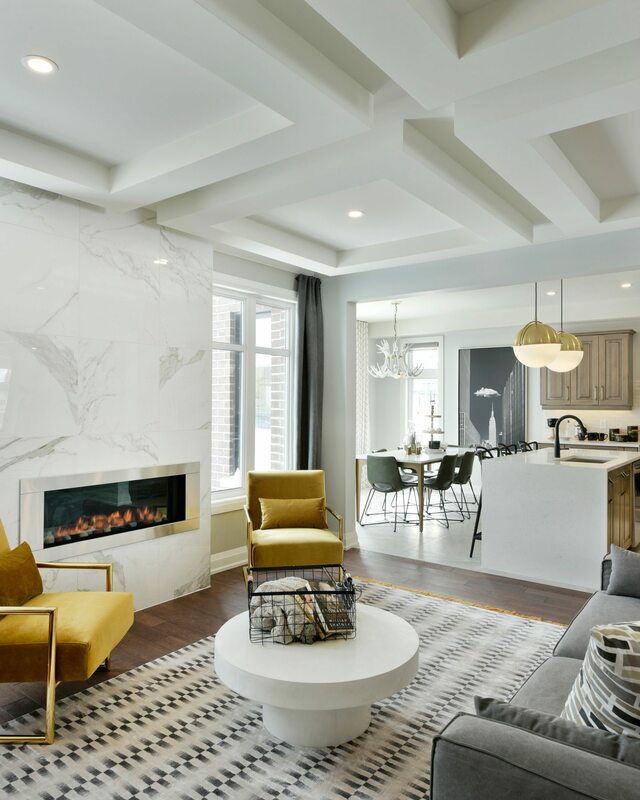 As in times past, the focal point of the home remains the great room’s fireplace, which stretches from floor to ceiling and is fashioned with porcelain tile influenced by a light Calacatta marble. Just off the great room, located at the back of the home, is a private study — perfect for catching up on some office work, quiet reading, or homework. To keep things organized, the Elderberry’s foyer is designed with a walk-in closet and the ever-essential mudroom. With its double door entranceway, the Elderberry’s master bedroom leads to an oversized suite with his-and-hers walk-in closets and a large ensuite bathroom defined by its free-standing tub. Every bedroom on the second floor has private access to a bathroom and ample closet space, and a laundry room is located upstairs for ease.